Pedrosa: "It was a fantastic pole position for me"
Repsol Honda duo of Dani Pedrosa and Marc Marquez had mixed successes in today’s qualifying sessions for tomorrow’s Grand Prix at the circuit de Catalunya, with Pedrosa taking pole position and breaking the lap record in the process and Marquez learning the track gradually, landing in sixth spot on tomorrow’s grid. Pfft, who needs qualifying tyres anyway? 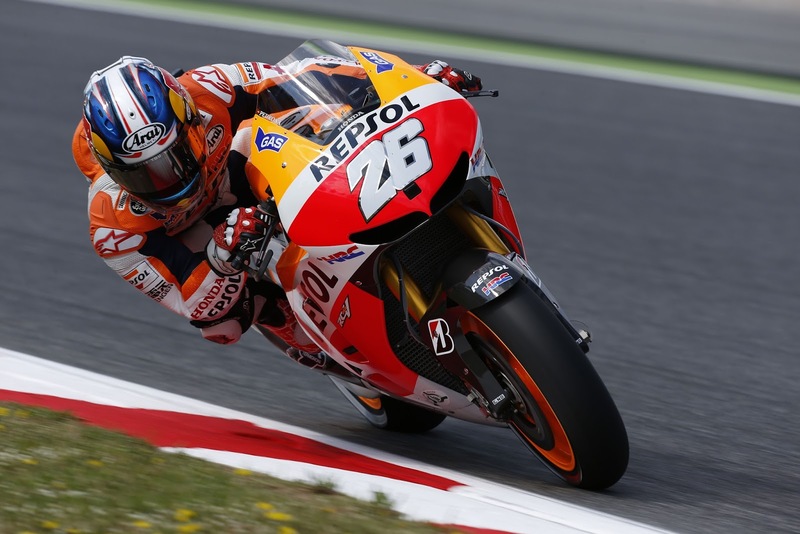 After finishing third in the morning’s FP3 session, Pedrosa upped his game considerably in the afternoon qualifying. From the off, the Spaniard who lives just a stone’s throw away from the Montmelò circuit, spent most of his time up the sharp end in Q2 and put in a near unbelievable lap time of 1m 40.893s on his fifth circulation to go top of the pile, which is almost three tenths faster than the previous lap record held by Casey Stoner on the Ducati with qualifying tyres from 2008. Rookie team mate, Marc Marquez spent a second day learning the Catalan circuit on a MotoGP bike. The reigning Moto2 world champion continued to impress fans at what is also very much his home circuit, by putting his RC213V Honda on top of the time sheets in the morning’s FP3 session. Next Next post: Byrne: "I just had to go for it"